September 25, 2015 | -by: Kevin George. How much of your time you devote to decide your subject line for your email campaign? Do you A/B test for your subject line to know which subject line works well for you? Well, if you have never thought of these questions, you are missing out on a great deal of opportunity. Email subject line is one of the most ignored aspects in email marketing. Marketers put in a lot of time in designing an email but forget that it is the subject line on the basis of which the recipient decides whether to open an email or not. Monks have analyzed the 2015 Adestra Subject Line Analysis Report, and will chant the holy mantras of effective words in a subject line across various industries. As good as 3 billion emails were sent across different industries, words like “Thanks” and “Thank You” in the subject line topped the list as they are usually used in transactional emails. Whereas, words line “forecast”, “training”, and “learn’ were at the bottom. This is because customers are more interested in offers and other benefits. Out of various factors affecting the open rate of an email, Subject line influences the most. Various other factors like the time of sending campaign, “From name”, and customer list are variable. A strong CTA like “Save” or “Buy” helps to generate more open rates and click rates as compared to words that does not sound beneficial to readers and are more related to providing information. Use of strong editorial content like “Breaking”, “Review”, and “Top Stories” results in great open as well click rate for Media Sector. The sales cycle in B2B industry is long thus intelligent use of words in subject line is a must. 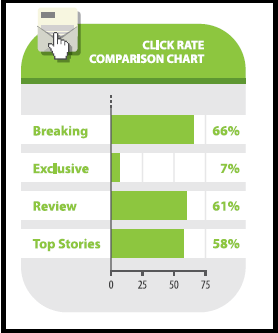 Words like “News” in the subject line is quite impactful and improves the click through rate. The unsubscribe rate matters more in B2B industry as compared to B2C because of high valued products and a complex sales process. Thus, it is important to maintain a long term relationship with the customer. Use of words in subject line that relate to long term relations like “Industry” or “Update” in the subject line to provide the industry updates or “LinkedIn” to connect to customers on social media. “Exhibition” was used in subject lines in B2B industry as well as in the Events Industry and the results were stunning. The word “Exhibition” in the subject line got the maximum click rate in B2B industry. On the other hand, click rate for media industry was bare minimum. Using right words in your subject line is significant. Relevancy is the key across all the industries. Offers and discounts are always top reasons for email opens. Promotional CTA perform better than the informational ones.